I made a post back in December 2011 about a gout attack I was having in the big toe of my right foot. You can read that post HERE. Long story short, I had never had gout prior to that attack almost two years ago. I talked about how bad the pain was, how I couldn't even put a sheet over my foot without the pain being unbearable. I went to my GP about it. He gave me some pain medication, inflammation meds and told me to stay off of it for a period of about 7-10 days. Well, how the hell was I supposed to stay off my feet for 7-10 days? I couldn't do that. Ridiculous. Anyway I did get better. I was able to get back on my treadmill, albeit at a slower pace than I was accustomed at the time. But, not long after that, the gout came back. I decided to continue on the treadmill regardless. Pretty soon I discovered what a foolhardy idea that was as I tried to get up out of bed to walk one morning. I was almost unable to walk at all. So, I made another appointment to my doctor. This time he had a blood sample taken (why he didn't do that the first time, I have no idea) to determine if my uric acid levels were high. A week later his nurse called me to tell me the tests came back to find that, indeed, my uric acid level was high, much too high. I was prescribed a daily dose of Allopurinol. Allopurinol is used to combat uric acid in your blood. Apparently, uric acid is the culprit of my gout attacks. My doctor started me out on one dose a day (in the evening I should say because that is when I took it) of Allopurinol.. So, I took this for about three months until it was time for my semi-annual checkup. Again, a blood sample was taken. About a week later, I got another call from my doctor's nurse. She told me my uric acid was again too high. I was told to double my dosage in the attempt to bring my uric acid level down. I started that double dosage back in June. The gout in big toe has not left me. I have good days when it is not so bad, like today, for example. I was told by a friend that Black Cherry Concentrate juice is very good for gout. I started taking it back in early August. Thus far, I have to say the results are mixed. I still have gout in that big toe of mine. That tells me my uric acid level is still too high. I'm not sure what is going to happen next. Maybe I have not given the Black Cherry juice enough time. I don't know. But, I have noticed the pain seems to be spreading from the big toe to up to the top of my right foot. 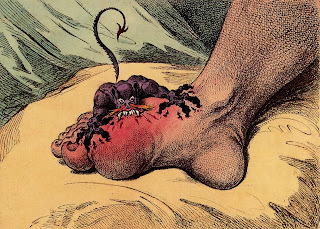 So, it appears that I'm going to go back to the doctor real soon for gout. It just doesn't seem to want to leave me. If anyone has any ideas on how to treat gout, whether it be ideas to discuss with my doctor or home remedies, I'm ready to try them. You can leave a comment here or fill out my contact form.